Presented by ISEA2013 and Sydney Harbor Foreshore Authority ‘Rocks PopUp’ and supported by dLuxMediaArts, Theta Lab is an experimental art research project combining neurofeedback with participatory art, electronic music and ‘slow design’ to explore and document qualities of attention and subjectivity facilitated by Alpha/Theta brainwave biofeedback. Electronic soundscapes modulated by changes in Theta and Alpha brainwave amplitude will assist participants to voluntarily shift their mental activity to a state of deep, hypnogogic stillness, a state of consciousness between wakefulness and dreaming. The aim of the project is to explore new contexts for aesthetic interactions, and to document the range of experiences afforded by this unusual form of human-computer interaction. 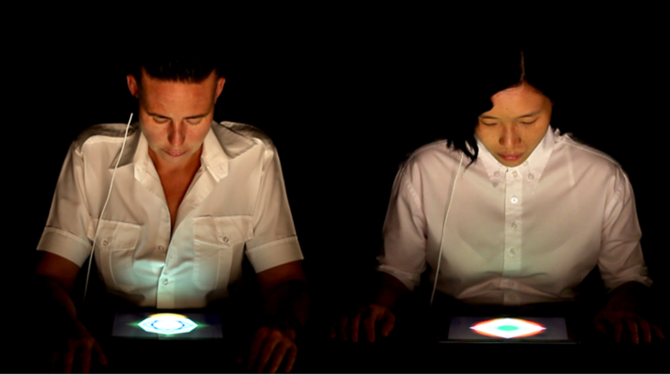 Theta Lab will host four four-hour participatory evening ‘performances’ for both ISEA2013 delegates and the general public. Volunteers are invited to participate in this research by interacting with Theta brainwave controlled soundscapes. During these ‘performances’, audiences will be able to observe up to 3 participants at a time. Each participant is expected to commit a total of 80 minutes to the project: a 10 minute EEG sensor fitting and tuning; a 10 minute how-to EEG induction session; a 30 minute neurofeedback interaction; and a 30 minute debriefing interview, in which they will share some details of their experience and impressions. For volunteer EOI and details of the recruitment process go to georgekhut.com from late April. Theta Lab will also host a special 4-hour workshop for ISEA2013 delegates. Methods and strategies used in the project will be discussed, together with an opportunity for participants to get some hands-on experience with the tools and mapping processes at the heart of the work. Participants: the general public and ISEA2013 delegates – aged 18+. Brown is a Sydney based composer and visual artist, who works in sound design, photography, illustration and animation. He holds a Masters of Audio Design and Digital Media from Sydney University (Major: Sound Design). He has been working collaboratively with theatre companies both locally and internationally for the past seven or so years to produce live soundtracks and visuals for different live performances. Recent composition and sound design projects include Matthew Day’s Intermission, Cannibal and Thousands, Victoria Hunt’s Copper Promises, Neil Bromwich and Zoe Walker’s Celestial Radio, Company SOIT’s (Belgium/Vienna) Café Prukel and Nomads, Matthew Prest and Claire Britton’s Hole in the Wall, Whale Chorus’ Rhapsody and Karen Therese’s The Riot Act.